The Extra Foundation Papers are listed in Alphabetical Order. This package includes newsprint to make an additional 4 placemats if you already have the instructions. This package includes newsprint to make an additional sample if you already have the instructions. This package includes newsprint to make an additional sample if you already have the instructions. This package includes newsprint to make an additional sample if you already have the instructions. This pattern option includes enough foundation papers to complete two Arizona Cactus Table Toppers. This package includes newsprint to make an additional sample if you already have the instructions. This package includes newsprint to make an additional sample if you already have the instructions. This pattern option includes enough foundation papers to complete one Bali Bed Runner. This package includes the additional extra foundation papers needed to extend the original Bali Fever pattern. into an 80" x 93".The larger sizes require additional packages of extra foundation papers.To enlarge into an 93" x 106" you will need your original pattern plus 2 packages of extra foundations.To enlarge into an 106" x 119" you will need your original pattern plus 3 packages of extra foundations. 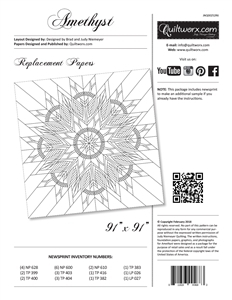 9 x 9 (116" x 116"): 3 Packages This package includes newsprint to make an additional sample if you already have the instructions. This package includes newsprint to make an additional sample if you already have the instructions. This package includes newsprint to make an additional sample if you already have the instructions. This package includes newsprint to make an additional quilt if you already have the instructions. This package includes newsprint to make an additional sample if you already have the instructions. This package of extra foundation papers includes enough foundation papers to complete a 72" x 73" quilt when included with the basic Cabin Fever pattern. If you would like to enlarge the quilt to 84" x 84", you will need two of these packages and if you would like to go up to 96" x 96", you will need three of these packages. This package of extra Foundation Papers includes enough foundation papers to complete three additional 17” by 51” table runners. 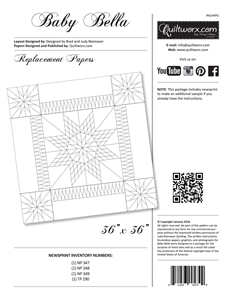 This pattern of extra foundations includes enough papers to make one table runner and four placemats Includes enough papers to expand the original 79" x 79" pattern to 119" x 119", or a 5 x 5 layout of the compass rose block (6 x 6 of the Captain's Wheel). Instructions for piecing and extra yardage are included in the original pattern. This package includes newsprint to make an additional sample if you already have the instructions. This package includes newsprint to make an additional sample if you already have the instructions. This package of Extra Foundations will increase your original quilt to a 90" x 90"
This package includes newsprint to make an additional sample if you already have the instructions. This pattern option will make an additional tree skirt. This package includes newsprint to make the existing pattern into a Queen Size Quilt, measuring 96" x 97".